I realised the other day, that since the New Year I’ve not been feeling myself. “Who have you been feeling then, eh?” << Thought I’d get the gag in before anyone else did. I’ve been feeling like an inferior, older, tireder and sadder version of myself. And that’s not been good. Was it the not running? I certainly felt like a different person when I wasn’t a ‘runner’ for four weeks. Maybe it was the lack of daylight and fresh air because I wasn’t running. With the atroctious weather we’ve had, some days I didn’t set foot outside the house. Maybe it was my recent birthday? I’ve never been too bothered about getting older, but this birthday did feel like standing on the platform at the top of a big playground slide, wobbling slightly before sliding down to the next ‘big birthday’. Maybe it was a hormonal thing. Perhaps it was the couple of weeks of bad sleep I seem to have had. Possibly it was because I have no new goals on the horizon, nothing big and scary to motivate me. By contrast, my husband has some big sporting challenges this year and is sickeningly enthused (and scared, truth be told). Actually I haven’t got a single race to prepare for as I have just been feeling too old and slow. Possibly, just maybe, it’s been a combination of all of these factors. Going down with a cold last weekend seemed like the final straw. Last week, I was fed up of feeling fed up. I felt bored, boring, tired, unfit and ready to give myself a good talking to (and a kick up the backside). After running too much too quickly a few weeks ago (which didn’t improve my mood) I decided to be sensible this time. I set off and ran just 3 times in the week, with plenty of rest in between and all at a slow easy pace. I bought some long overdue new trainers (which are scarily white, shiny and pink, Ugh!) I tried to get to bed at a better time, and resolved to make sure I was eating better with less sugary rubbish. 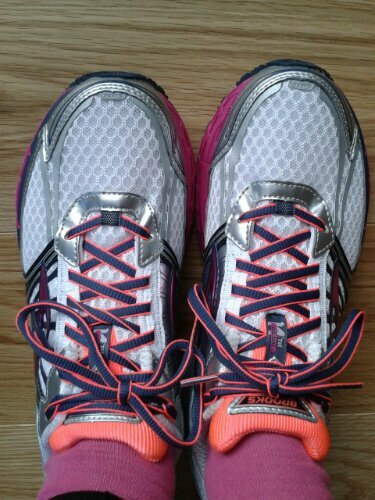 New trainers – scarily clean and PINK! This week, after shaking off the cold, I feel better. I’ve run on two cold but clear mornings. I’ve had some better sleep. I’ve eaten more fruit and veg, tried to cut out the chocolate, and thought about how much protein I need. 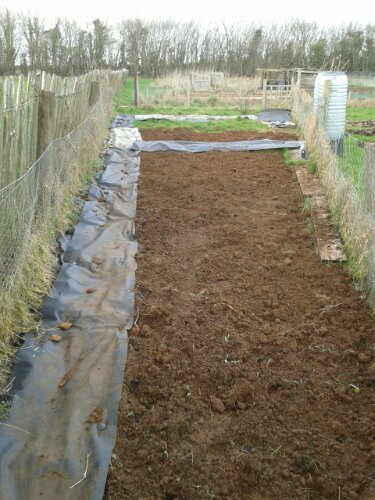 I’ve even spent several hours digging on my neglected allotment. It feels like a weight is being lifted from me, and I’m liking it. Right then – where’s the race calendar? 2014, I’m finally ready for you!